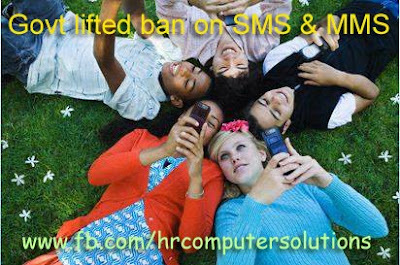 NEW DELHI: Government on Thursday lifted the ban on bulk SMS and MMSes with immediate effect -- a day before the earlier stipulated deadline of August 31. The telecom ministry had, on direction of home ministry, imposed the ban for 15 days on August 17. Later, the restriction was reviewed on August 24 when the telecom ministry increased the limit from five SMSes to 20 SMSes. "After reviewing the matter again on Thursday, the ministry lifted the restriction allowing citizens to use text messages and MMSes without any limit of numbers with immediate effect", said a home ministry official. As MPs cutting across party lines had pitched for a foolproof mechanism to check spread of rumours that led to exodus of people from the northeast in certain states, the government on August 17 had imposed the ban on bulk SMSs and MMSs for 15 days across the country. As per that decision, no one was allowed to send more than five SMSs at one go and more than 20 KB of data from a cellphone for the next 15 days. Though such a ban may not put a complete check on spread of false or misleading information, officials believed that the mechanism coupled with strict monitoring of flow of SMSs had certainly acted as a deterrent.